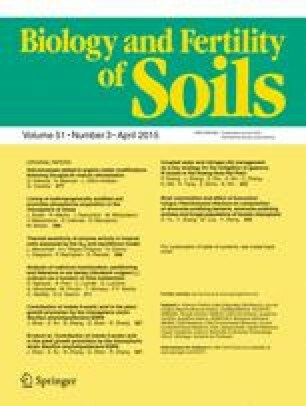 We studied the effect of liming and P fertilization of extremely acid soil (accidently acidified by sulfidic mining waste) on P availability and the subsequent adaptive responses of wheat roots. The wheat plants were grown in rhizoboxes allowing precise sampling of rhizosphere and bulk soil for sequential extraction of P fractions and determination of exchangeable Al. Root exudates were collected by pieces of paper for electrophoresis and subjected to HPLC analysis. Expression of organic anions and Pi transporter genes was analyzed by a real-time quantitative PCR. The concomitant application of lime with P fertilization increased the concentrations of plant-available P fractions in both rhizosphere and bulk compartments. The applied soil amendments strongly affected plant growth, biomass partitioning and shoot P accumulation. Liming enhanced root exudation of citrate in P unfertilized plants, while the high malate efflux was maintained until both P deficiency and Al toxicity were eliminated by the amendments. We showed the importance of liming for recovering of P acquisition potential of wheat roots, which can be strongly impaired in acid soils. Our results clearly demonstrated that P-deficient roots not subjected to Al stress in the limed soil can maintain high efflux of malate and even increase efflux of citrate along with the enhanced expression of related anion transporters (TaMATE1 and TaALMT1). The paper is dedicated to the memory of Prof. Volker Römheld. This work was supported by the Serbian Ministry for Education, Science and Technological Development projects OI-173028 and OI-173005. We thank Prof. Zed Rengel (University of Western Australia) for stimulating discussion and critical reading of the manuscript.